Boxon was founded as Ramlösa Lådfabrik (=Ramlösa Box Factory in eng.) in Ramlösa near Helsingborg, Sweden, in 1932. Our basic philosophy has always revolved around packages and packaging. It was current CEO Anders Yllfors’ grandfather who started the business. During the years, Boxon has grown through both acquisitions and investments into new business areas. When times has been difficult we have seen the possibilities instead of holding back. We believe in the team work and effort required to reach our goals together. Today, Boxon is one of the leading packaging and labeling companies in the Nordic countries, and the only Nordic company to offer both packaging and marking solutions. 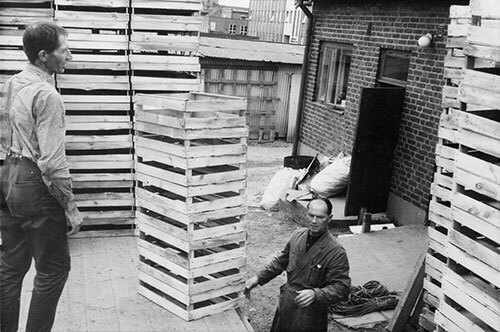 Boxon, as Ramlösa Lådfabrik, in the 1930's. During the third generational change of Boxon in 1997 – when current CEO Anders Yllfors took over – a strategic process was initiated to take the business into a new millennium. Its current name Boxon was chosen to give the company a more international identity. Boxon is now a privately owned company that has become a leading provider of packaging solutions thanks to ambition, vision and sheer hard work. In the beginning of 2010, we realised that many of our Scandinavian and European customers who had moved their manufacturing to China was looking for a local provider of packaging materials and solutions. Several industry operators was reluctant to yield to customer demands and opted to continue serving customers from Sweden. Hence, Boxon was one of the first Scandinavian packaging companies to enter the Chinese area, and we’ve now developed excellent customer relationships and a broad customer base. From the start we’ve decided to implement our Scandinavian business model in China which has shown to be a great success. We’ve now developed Boxon China into a well-functioning supplier and packaging partner for our customers. Locally in China we have sales staff, sales support, logistics experts, purchasers, marketers and a construction and design department. Everything indicates that we are in China to stay.